The weather has been shite the last several days with rain, drizzle and fog. I have to admit I haven't felt like doing much. This morning the sun was out for about an hour and it gave me enough oomph to get down to the RV and bring up the doors. Of course I just realized that I left the one under the stove. Aargh. They are now in the woodshed awaiting my attention. I also had to get a flat head screwdriver because the old stitch cutter I was using to get under the staples of the valances broke on me. Such is the way of it. 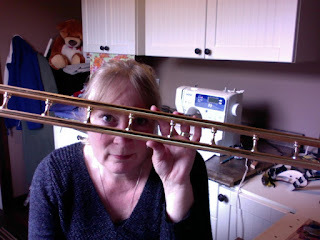 The hardest valance - the one for the entry door which has a little shelf sorta thingy on it is done. I literally just finished it and that thing had to have had at least 300 staples in it. Its only 2ft wide! Wowsers. I was stalling starting that one because I wasn't sure how to get the shelf thingy off of it. Naturally as soon as I took the time to look at it I knew I could just pry the shelf off and that is exactly what I did. It didn't break either!! WooHoo! So, only two more valances to do but they are bigguns. And lets be real its a triple eviction on Big Brother tonight! LOL Yes I'm a fan of BB, Survivor, Star Wars AND a Trekkie. Move on. Brad just shakes his head at me but a girl has needs and those are mine. Praying that someone somewhere posts BB and Survivor on YouTube so I can watch them from the road next year. Twitch Twitch. Speaking of Brad, his face is doing much better with proper medication but whatever it is they have him on takes the energy and gumption out of him. His jaw area around the former tooth is still tender though the swelling is all but gone and he is able to eat without much agony, always a bonus. The EPDM roof is due to arrive on Tuesday next week and the 3 Fantastic Fans I ordered arrived in Moncton, NB 5 days ago and according to the UPS website they have not moved since. Also, still no word from Mr. with the truck bay. I phoned around yesterday looking for something else but there is nothing so I sure hope he pulls through for us. We ordered a Berkey Water Filter finally. So excited for this thing, I will keep you all posted on what we think of it. We got a confirmation email of the order but nothing yet saying it has shipped. Did I mention it would have been sooooo much easier to fix this rig somewhere else? Oh, I did? Okay. Special shoutout to my 'lil buddy Todd who is wandering aimlessly in China at the moment. Sure hope your alright over there. ( I recently found out he actually reads this Blog, so..) I sure like this kid (young man) he makes great videos, so if you haven't already then go check him out - and Subscribe!